Fort Powell (1862-1864) - A Confederate fortification established in 1862 during the U.S. Civil War in Mobile Bay, Mobile County, Alabama. Destroyed and abandoned in 1864. 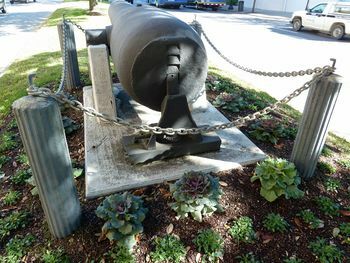 Fort Powell was located on a shell island at Grant's Pass in Mobile Bay. The fort was not complete but would mount 5 rifled guns, 5 field howitzers and 2 long range guns. The emplacements were connected to the central magazine by tunnels. On 5 Aug 1864, the fort was shelled from the rear (Mobile Bay) at short range by the Union gunboat Chickasaw. The fort commander, Ltc James M. Williams, alarmed by the ferocity of the shelling, received permission to abandon the fort. He left behind Lieutenants Savage and Jeffers to spike the guns and blow up the magazine. The order was given at 10:30 PM and Fort Powell was blown up. 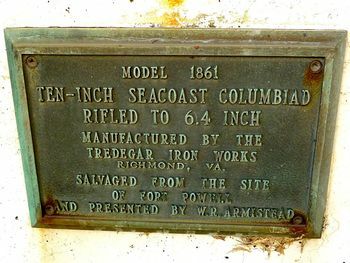 The fort was destroyed but the guns were not and they were captured by the Union forces. In Mobile Bay, Mobile County, Alabama. Location: Mobile Bay, Mobile County, Alabama. Map point is approximate.